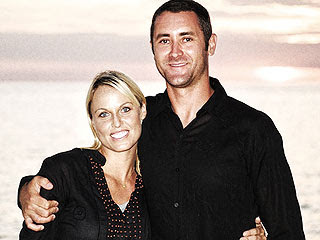 Olympic Medalist Amanda Beard has announced she is married and expecting her first baby – a boy in September! According to People the couple said “I do” in a brief sunset ceremony on a private beach at their resort. “I’ve always said, ‘I want to get married barefoot on the sand,’ ” says Beard. And she did. But following local custom, both bride and groom adhered to Muslim tradition and covered much of their bodies for the ceremony. She wore a black, long-sleeved tunic, a sarong and a white veil, while Brown also wore a sarong (“A long, manly sarong,” Beard jokes. “He felt he looked like Aladdin!”), a hat – and a sword. After the ceremony they exchanged hand-written vows over a romantic steak dinner and a two-tiered chocolate cake with chocolate chips and white frosting. Also on the menu: non-alcoholic Shirley Temples. “I’m starting to look pregnant,” says the newlywed, who cops to major ice cream and Popsicle cravings and, despite exercise, is feeling “a little softer.” She plans to get back in the water about half a year after she gives birth, and is aiming to compete in the 2012 Olympics. When asked if a water birth could be in her future?